4x12 Deflecto Contemporary Brown Plastic Register Discounts Apply ! Plastic floor registers are perfect for indoor or outdoor use because they don't rust. Heat vent covers are also great in the bathroom since they minimize condensation. These plastic floor registers are very durable and are made with a calcium filled polypropylene ensuring longevity. Your heat vent covers are safe to use around children and pets because the faceplates don't get hot like traditional metal registers. 4x12 Plastic floor registers lay flat for safety and have rounded corners giving them a clean finished look. 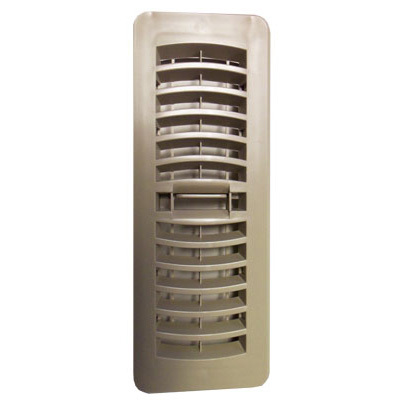 This heat vent cover has an adjustable, easy to use damper so you can control the air flow. Plastic floor registers are maintenance free and perfect for use in new construction or as replacements in your existing home or office. These heat vent covers couldn't be easier to install, simply place into the floor and you're done. Faceplate Size: 5 1/8" x 13 1/8" Drop-in Depth 1 1/4"
Order your plastic floor registers today!